Attention all parents of buggy-lovin’ babies: you can officially return to an art gallery! Chicago’s very own Museum of Contemporary Art, a.k.a. the MCA, welcomes families with open arms. The striking collection of modern art at this world-class museum will impress both parents and kids alike. Even babies will love the bright colors and bold, modern shapes. Adults will appreciate the big names in art on display: Chuck Close, Christo, Calder, Cindy Sherman and Warhol, to name a few. On the first Wednesday of the month, from 11:30 am – 12:30 pm, you can enjoy an hour of art with your little one as part of the Stroller Tour Series. 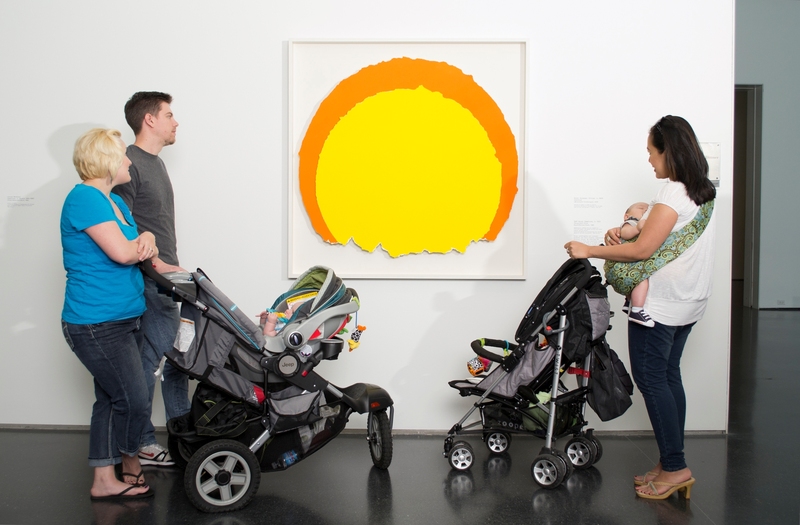 Designed with moms and dads of babies in mind, take in a guided tour and update yourself on the latest in the art world without having to worry about causing a stir if your sweetie pie decides to fill up his diaper or throw a full-out tantrum. Tours are free with admission. Also starting in October are the MCA’s acclaimed Family Days. Every second Saturday from 11am – 3pm, pop into the museum with your entire family for gallery walks, hands-on art activities, scavenger hunts, Look ‘n’ Learn stations, and more. Best of all: Admission is FREE For families with children 12 and under, and activities are appropriate for all ages.